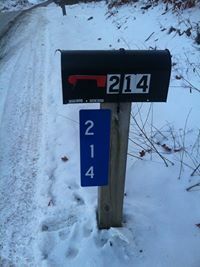 Help emergency vehicles find your home with these attractive blue address signs. When emergency responders receive your call for help, they are given an address of the emergency location. What if the emergency is at YOUR home? Is your address number obvious and properly erected for the professionals to see it from the road? Dunlap Fire is offering free installation of Blue Address signs to help us better identify addresses in neighborhoods and rural areas. These signs are extremely helpful in cases of inclement weather and night time emergencies. The Dunlap Fire Protection District is offering these signs for free with donation to Dunlap Fire and Rescue Association. Option 1: On the mailbox as shown. They can be screwed into metal, plastic or wood mailboxes. DFPD Personnel will put these on mailboxes. Option 2: A 4 Ft Green U-Post and Blue Address sign will be pre-attached together and delivered to the Occupants house. DFPD Personnel will NOT set any post in the ground. DFPD will advise the occupant to call JULIE before they place posts in the ground. Julie is a free service that will come scan your yard for gas lines, power lines, water pipes, etc. The posts are being offered only if the driveway and the mailboxes are not together or for some reason a post is needed to indicate the right residence. JULIE, free underground locating service.